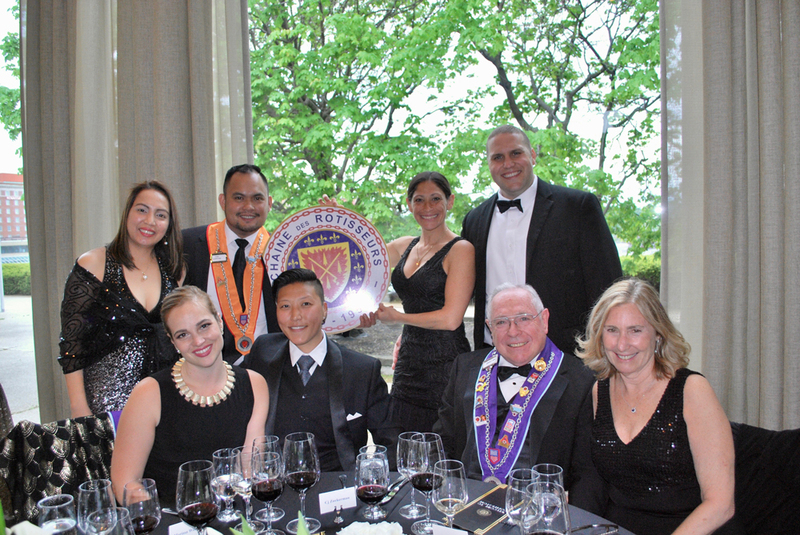 Albany induction dinners are always special occasions and our 2017 event was no exception. 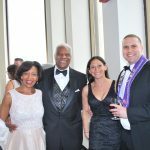 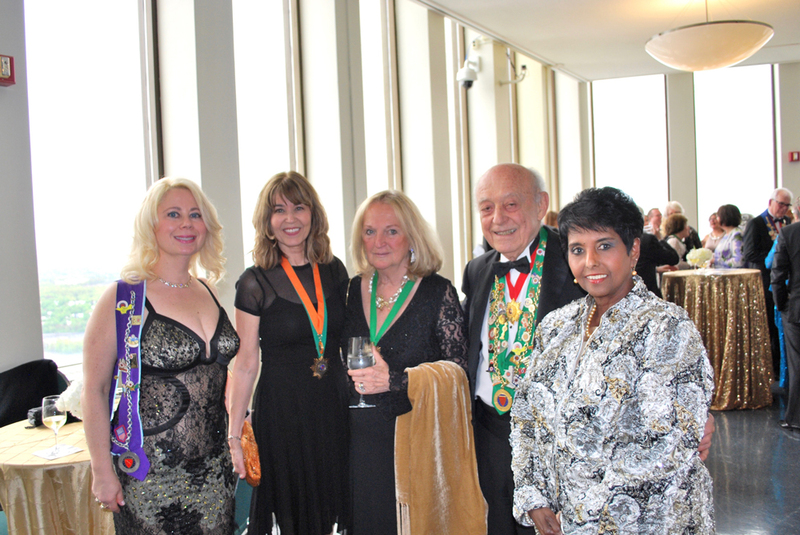 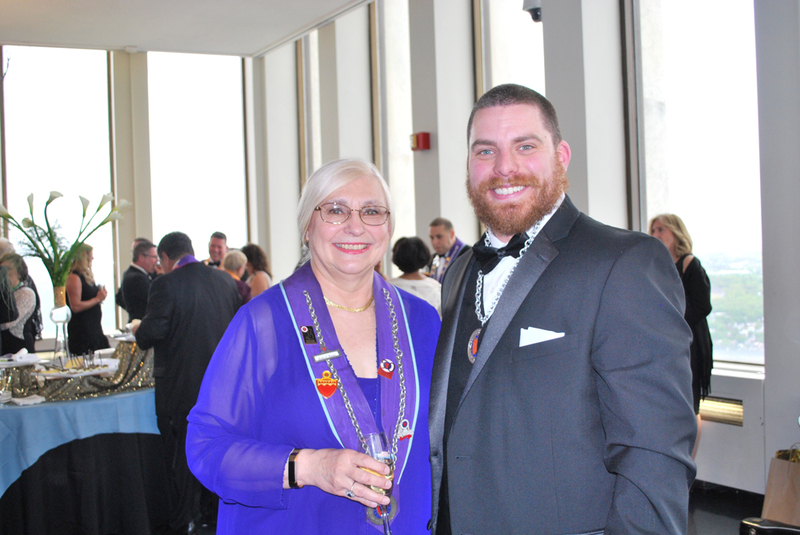 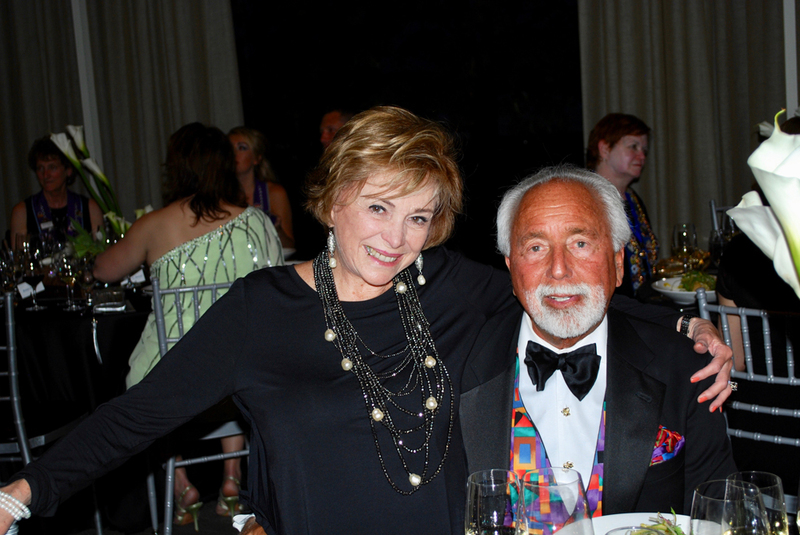 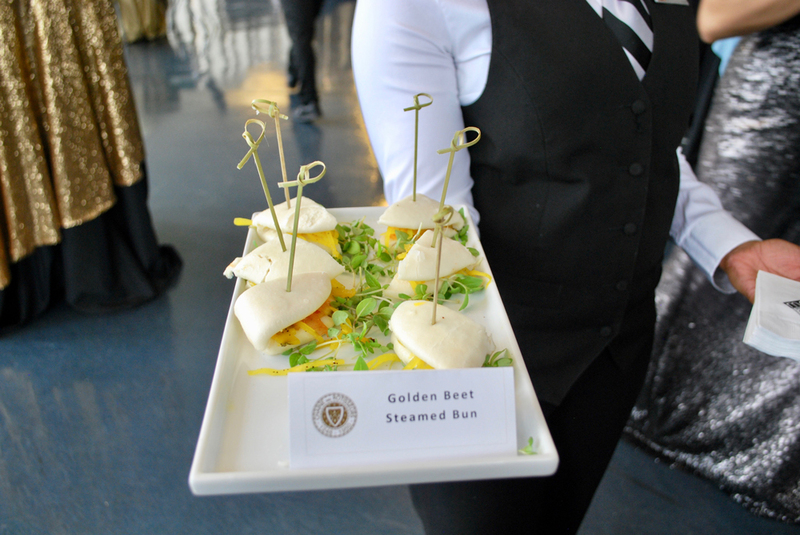 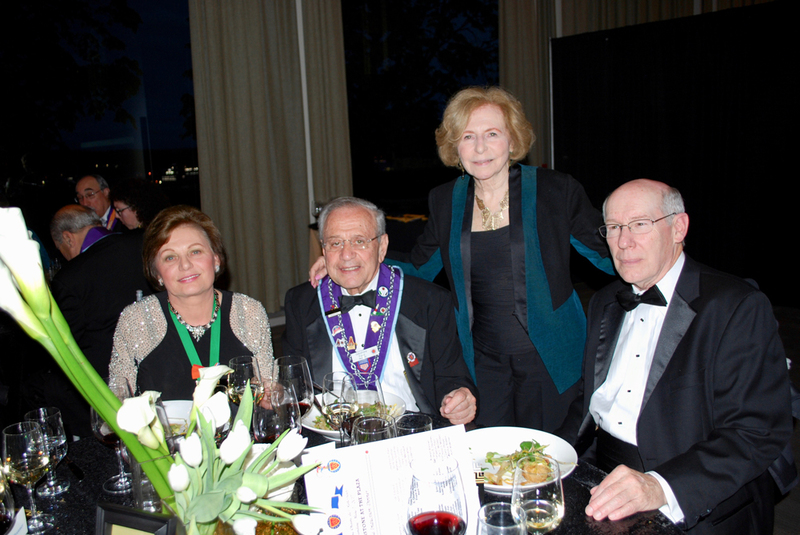 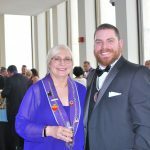 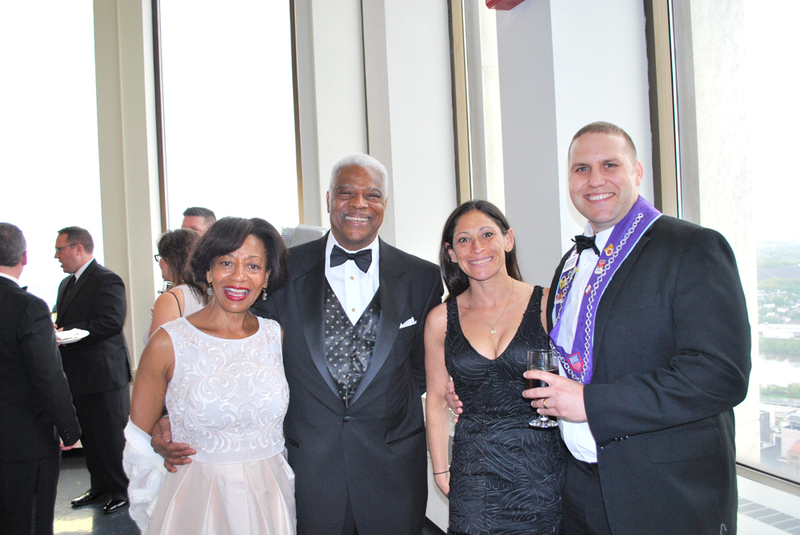 On Sunday, May 7th some 64 members and guests assembled at the Empire State Plaza to enjoy a seven course feast. 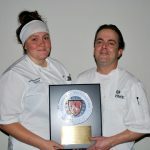 But wait, we are getting ahead of ourselves. 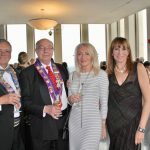 The Champagne reception was held on the observation deck of the Corning Tower, the tallest building in perhaps 100 miles. 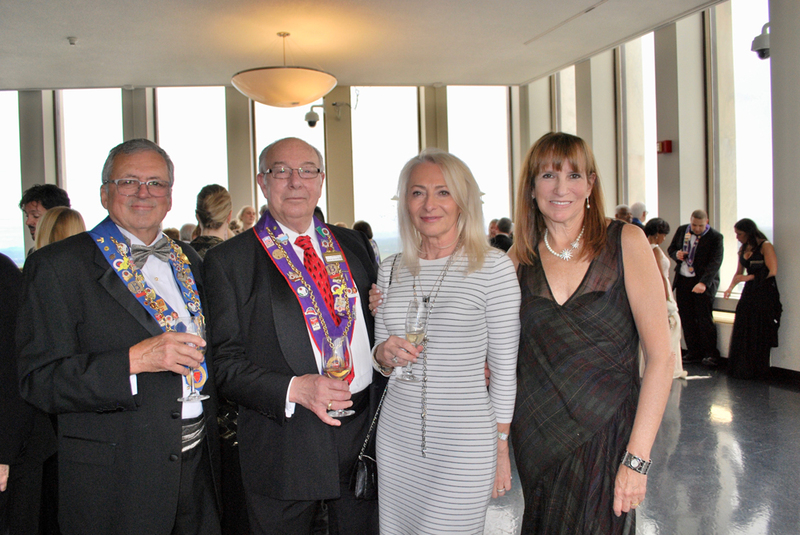 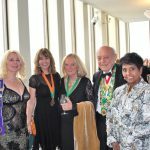 From 42 stories up, Chaine members and guests were treated to spectacular views of the City of Albany, the Hudson River and the surrounding countryside. 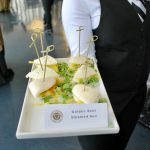 Delectable butler passed hors d’oeuvres were offered as well as an open bar. 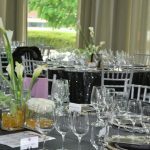 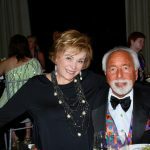 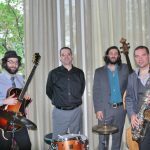 The ambience was furthered by the presence of a four piece jazz group furnishing background music while the guests enjoyed the views, the drinks and each other’s company. 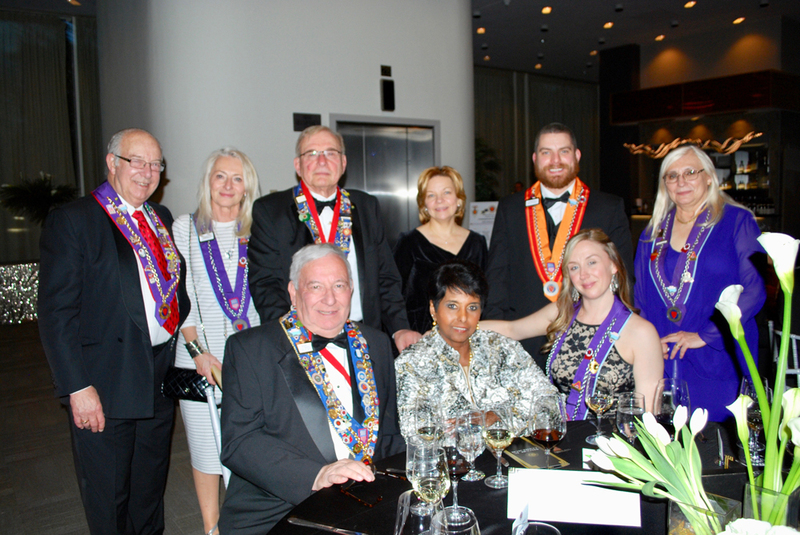 Following the hour-long reception, we adjourned to the Cornerstone Restaurant located on the ground level and providing views of the marbled buildings, walkways and impressive modernistic plaza erected under Governor Rockefeller’s aegis. 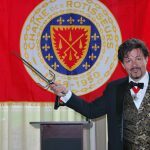 This prime location was recently taken over by Officier Maître Rôtisseur Angelo Mazzone who made significant upgrades to the venue and at least currently plans to utilize it for catering events. 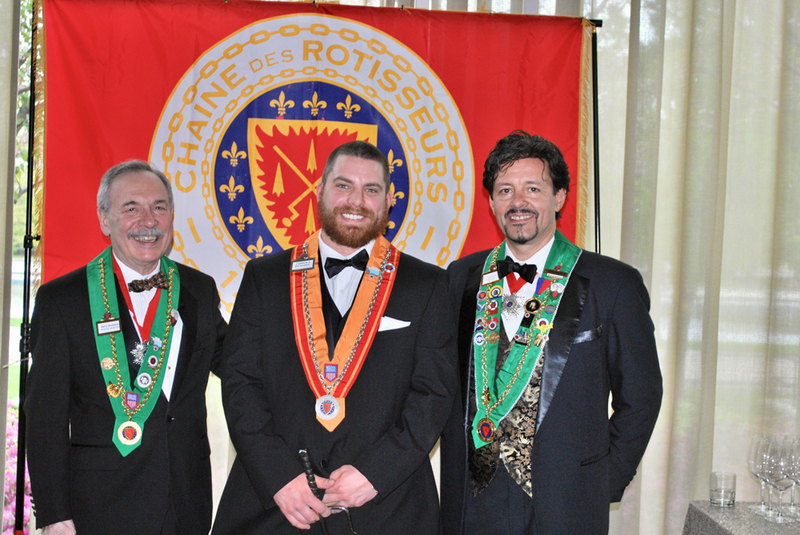 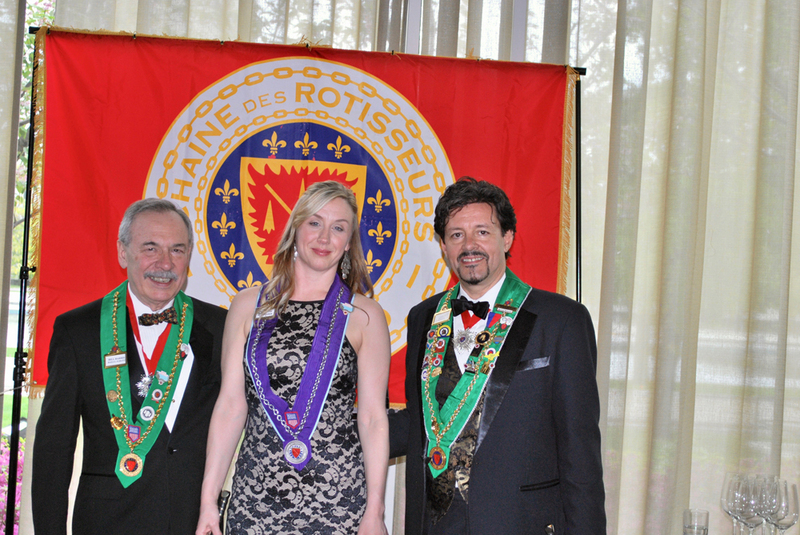 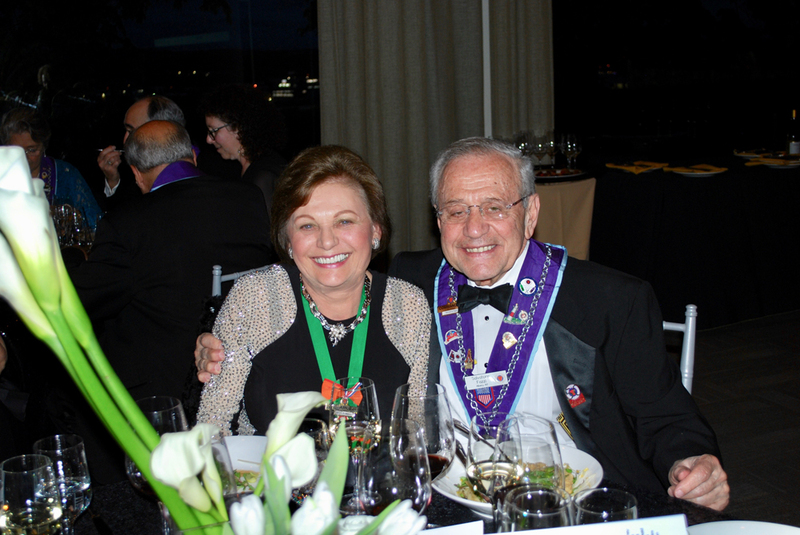 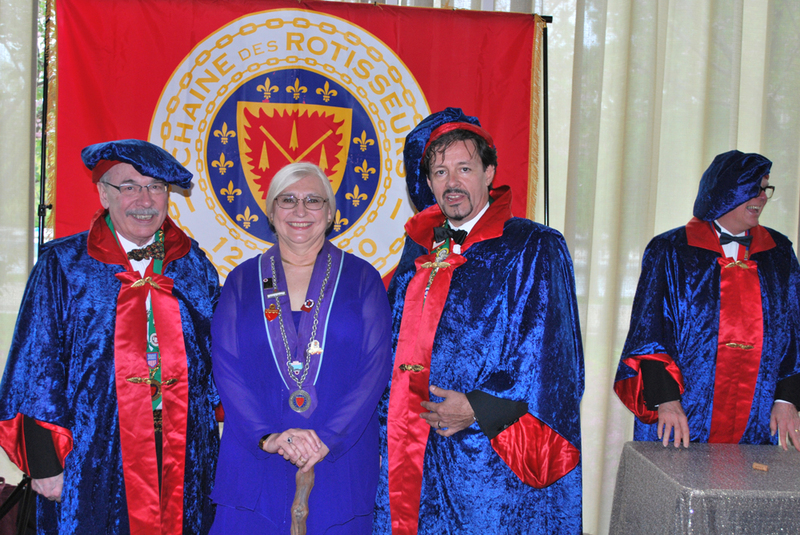 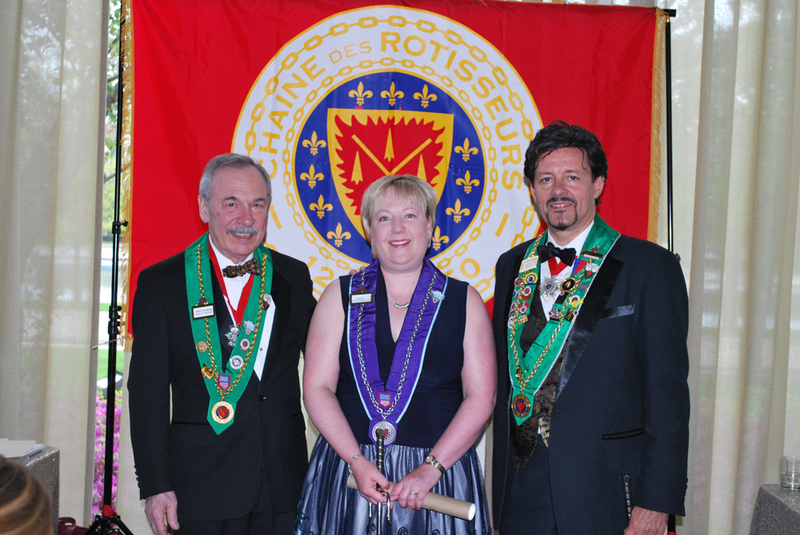 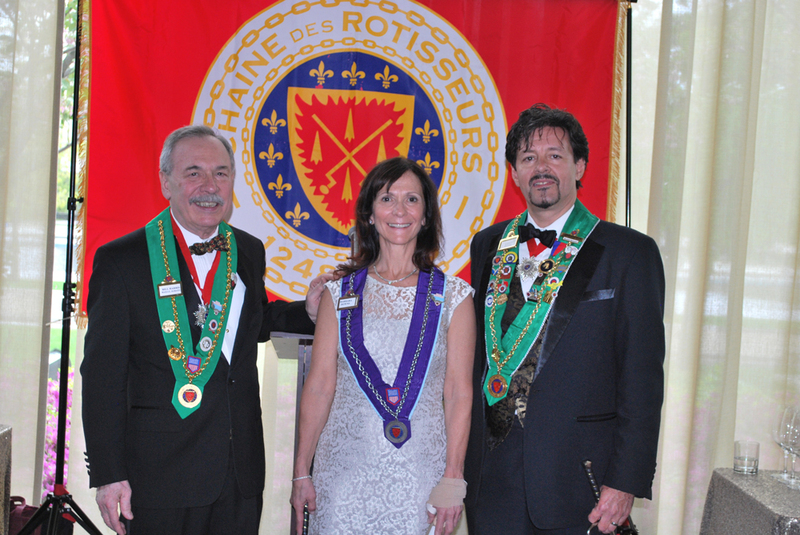 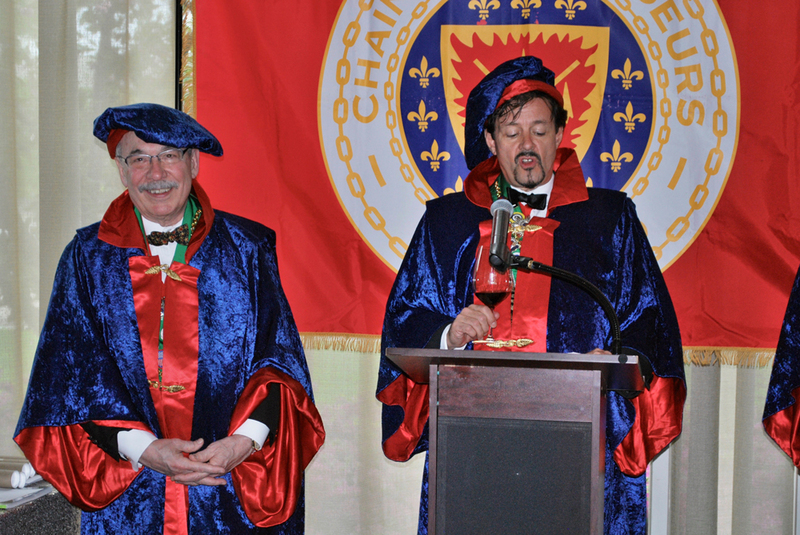 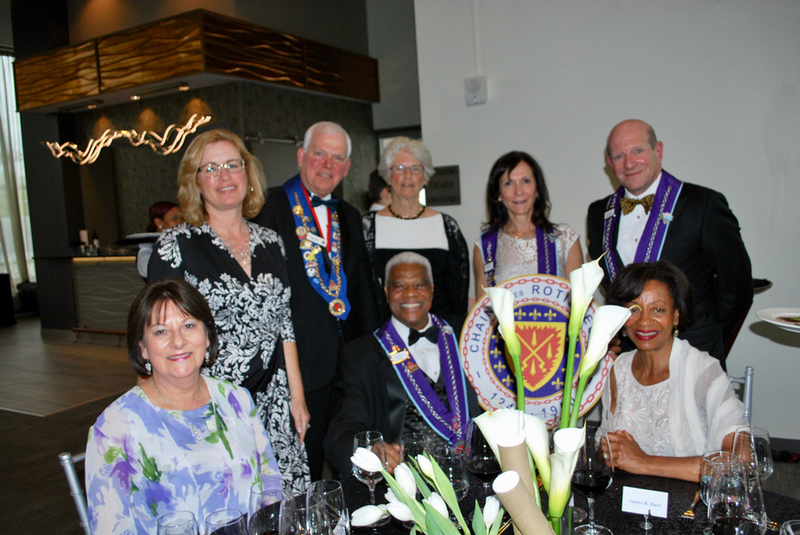 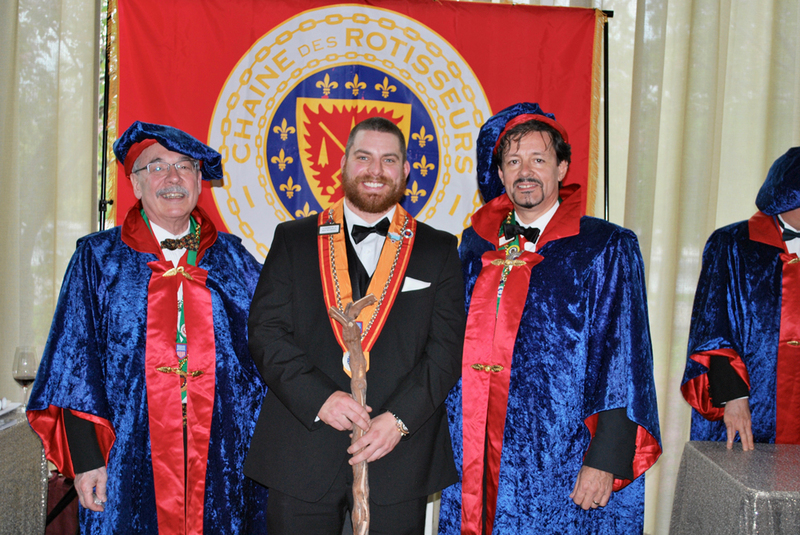 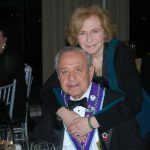 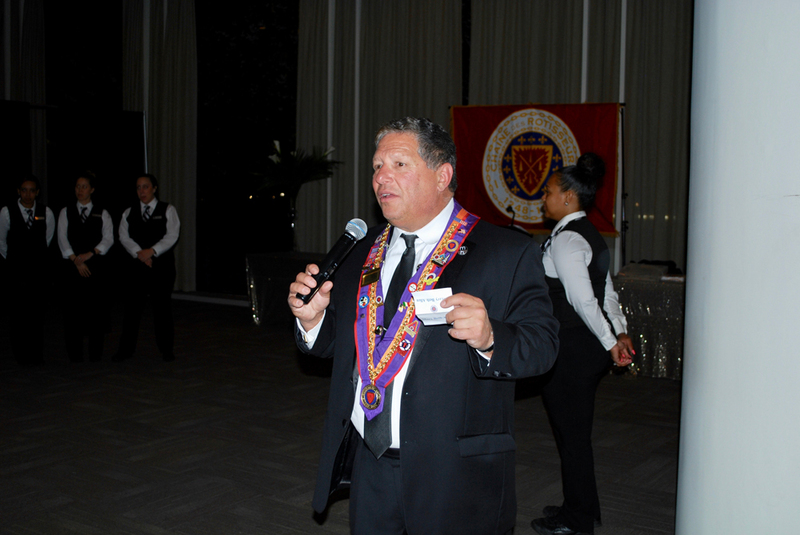 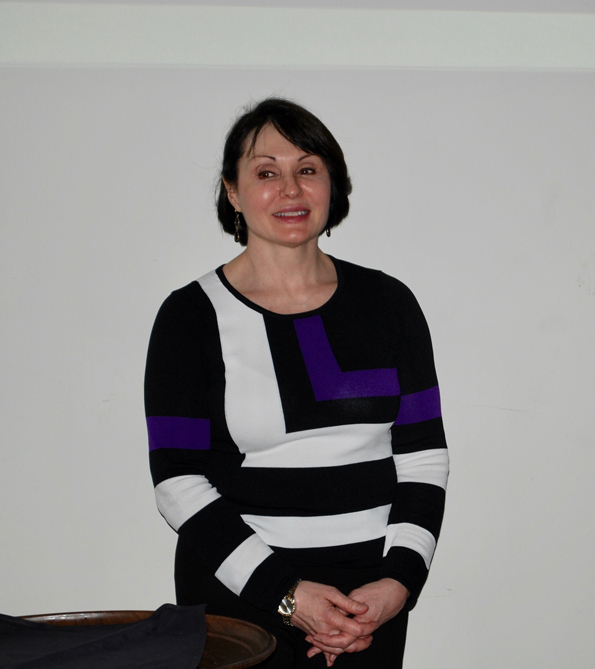 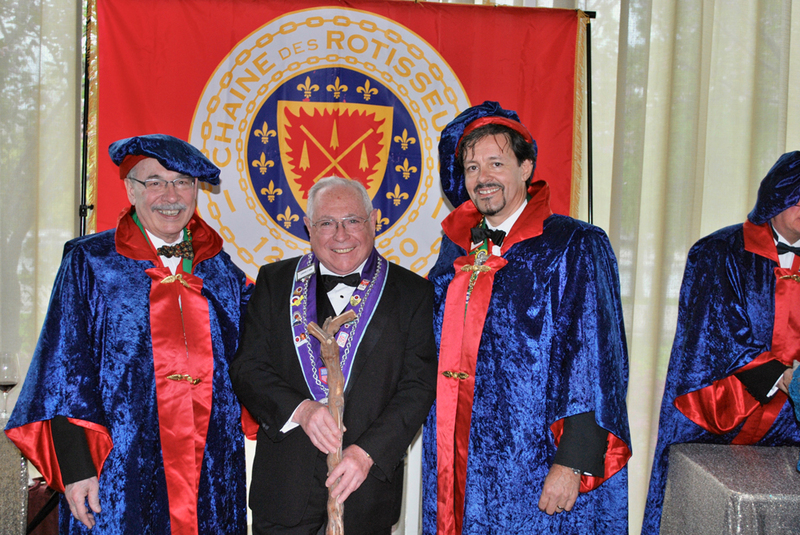 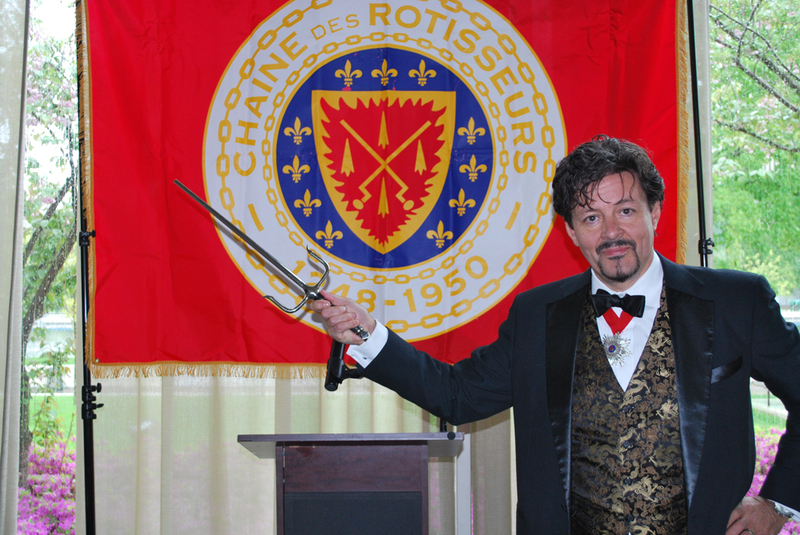 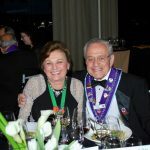 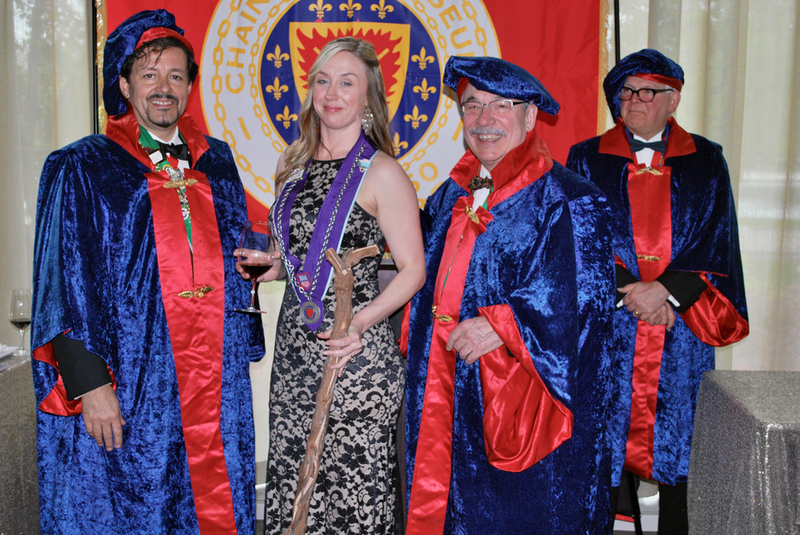 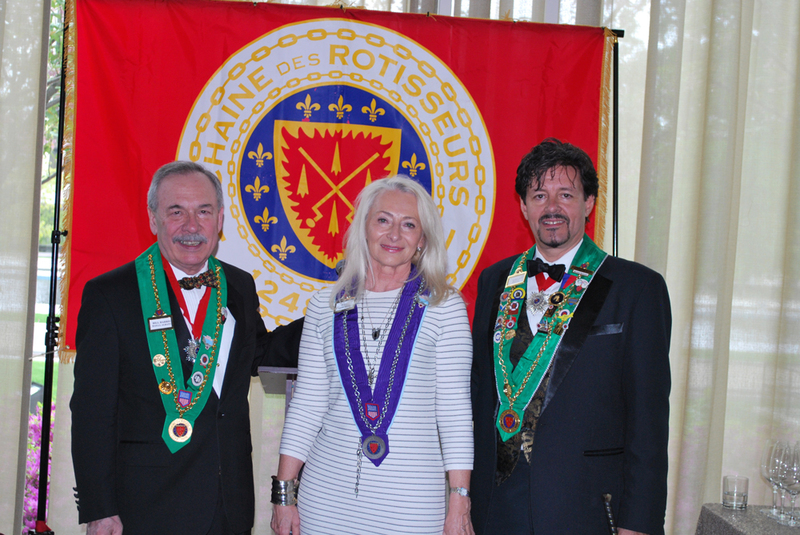 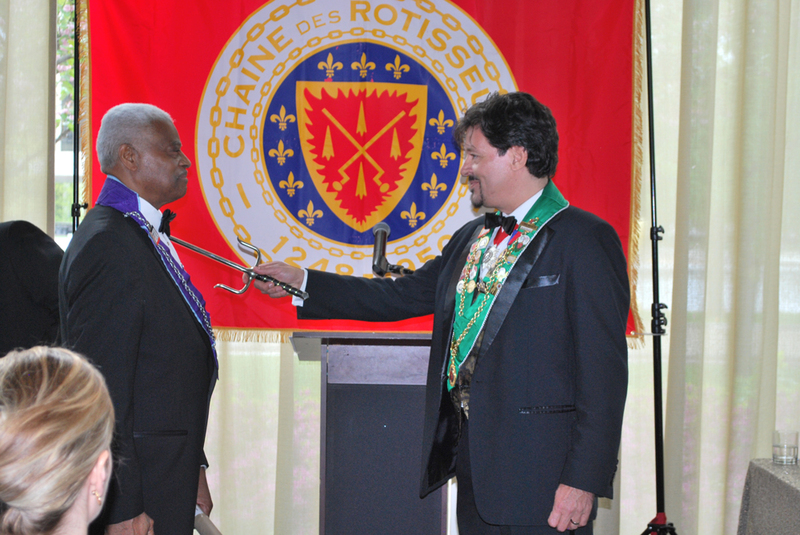 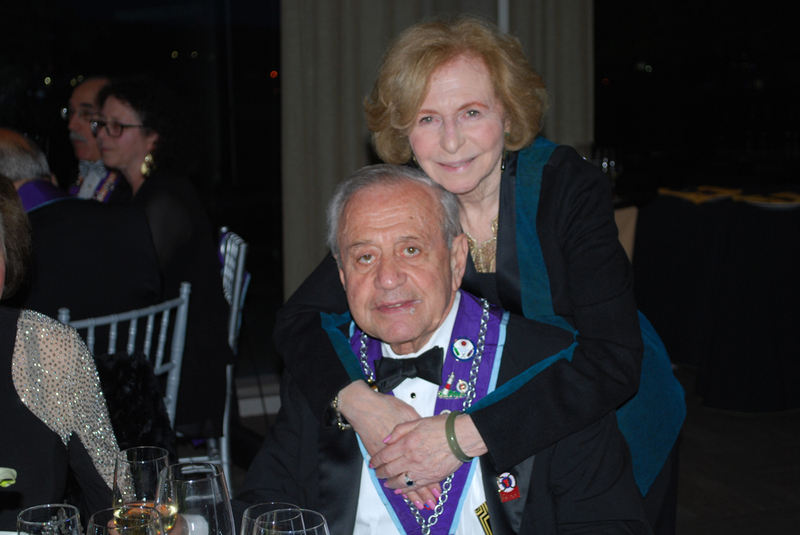 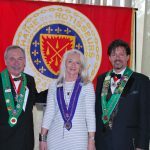 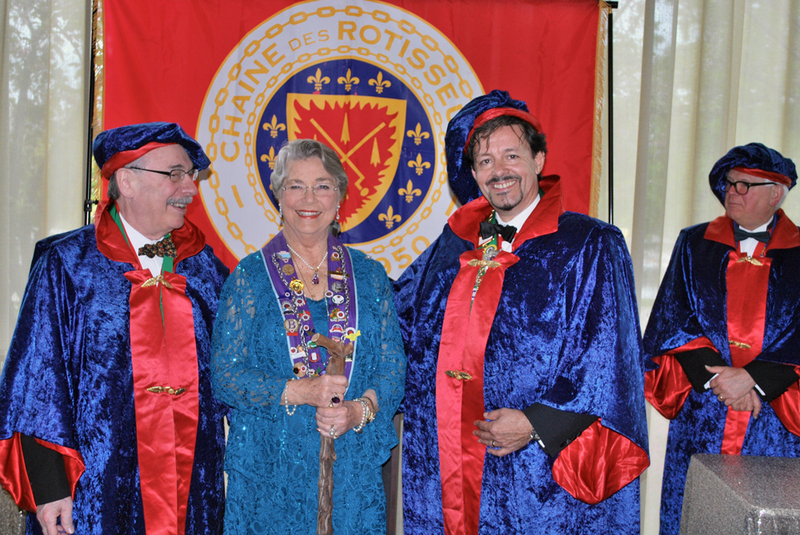 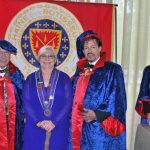 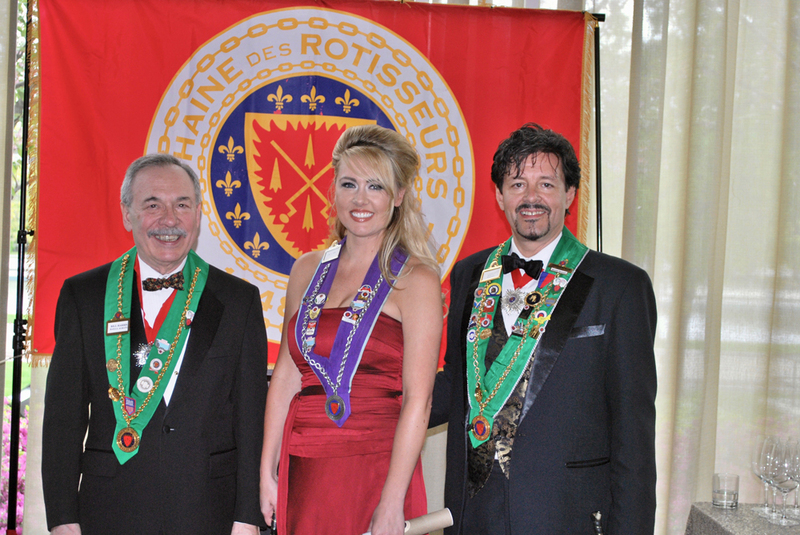 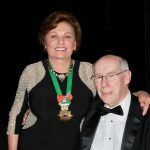 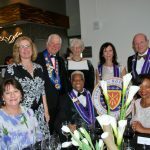 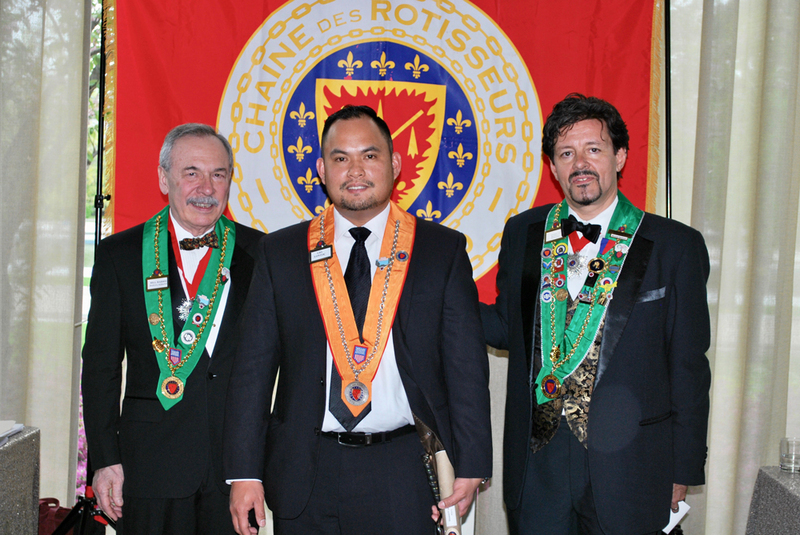 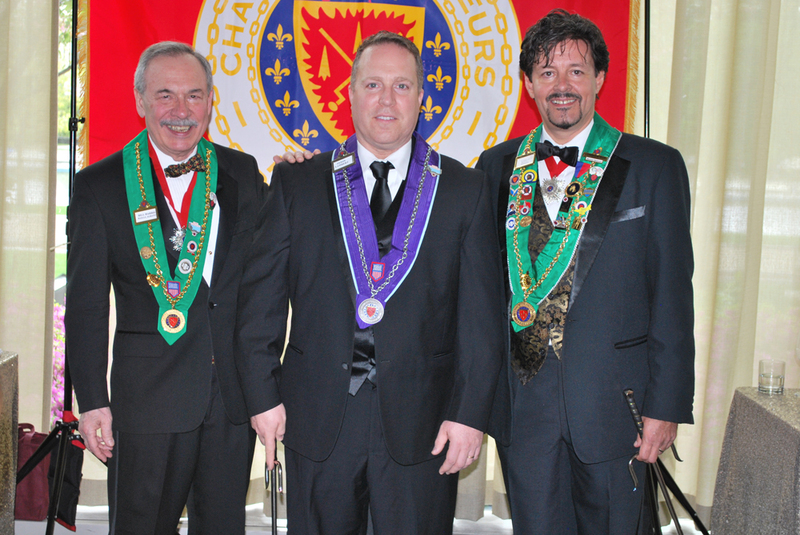 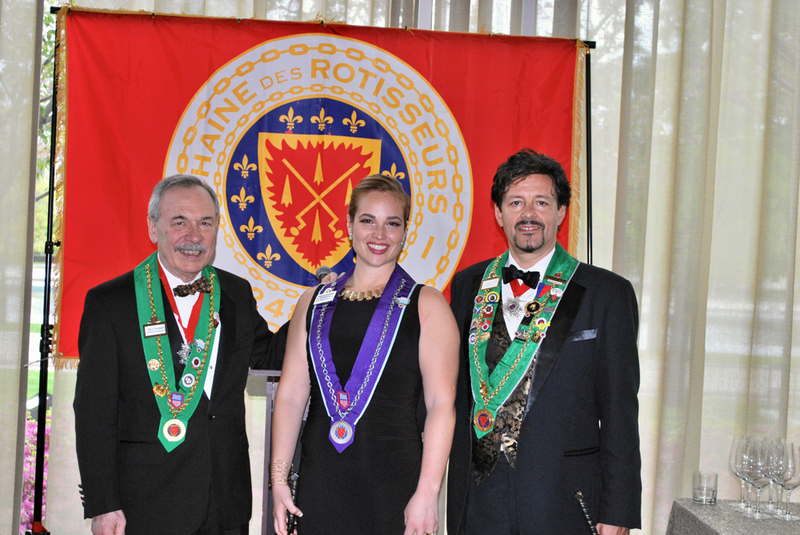 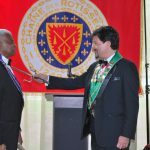 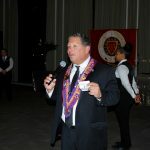 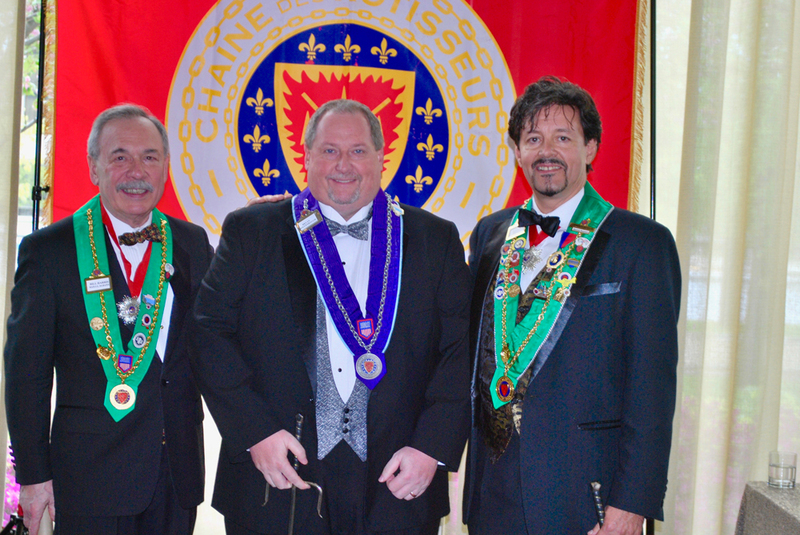 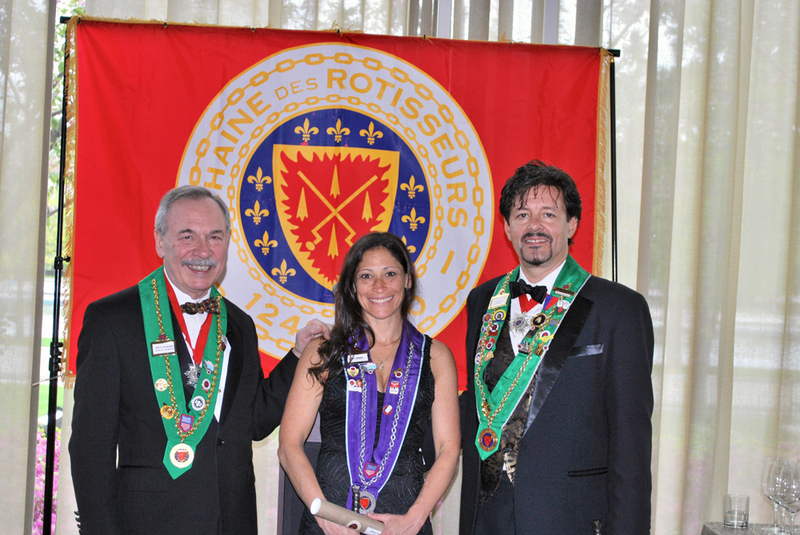 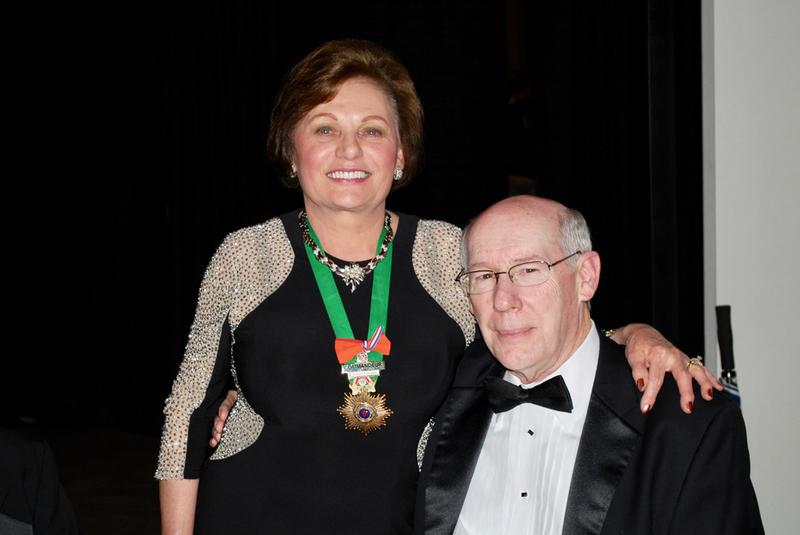 Chambellan Provincial Marshall L. Berenson enthusiastically presided over the induction ceremony for 12 inductees and one elevé, ensuring that the new members were aware of the Chaine’s storied history and traditions, and detailing the various elements of the Chaine logo. 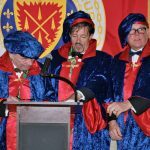 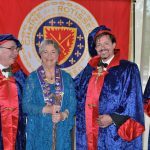 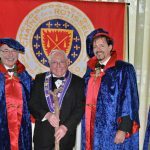 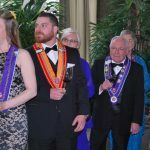 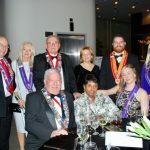 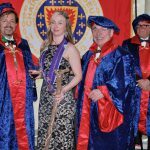 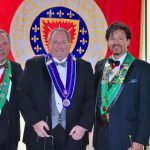 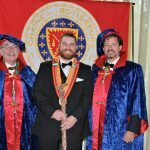 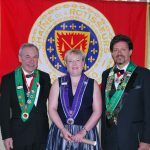 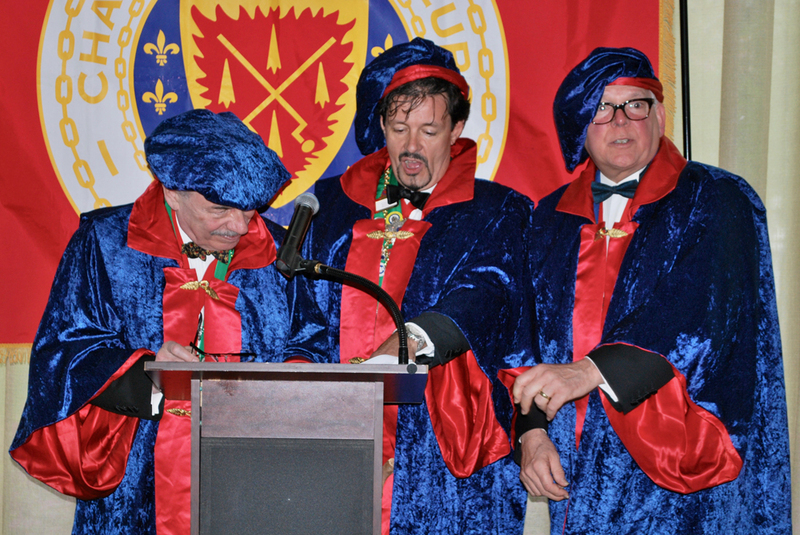 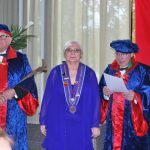 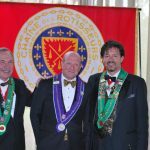 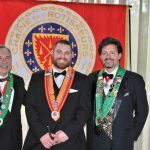 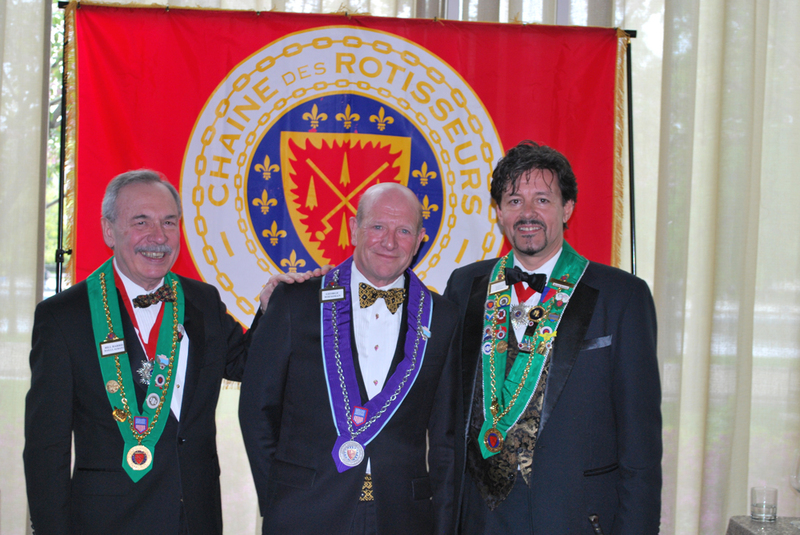 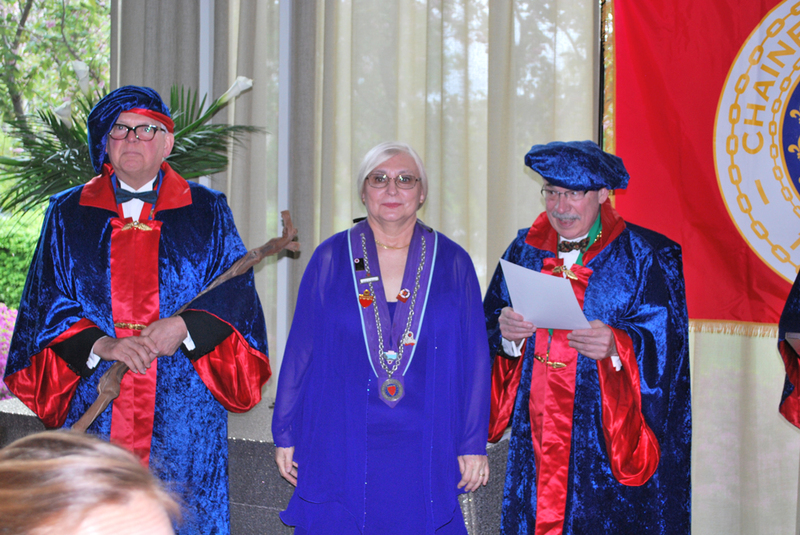 Following the Chaine inductions, five new members were brought into the Mondiale fold in a light-hearted ritual featuring all of the Mondiale regalia that clearly delighted the audience. 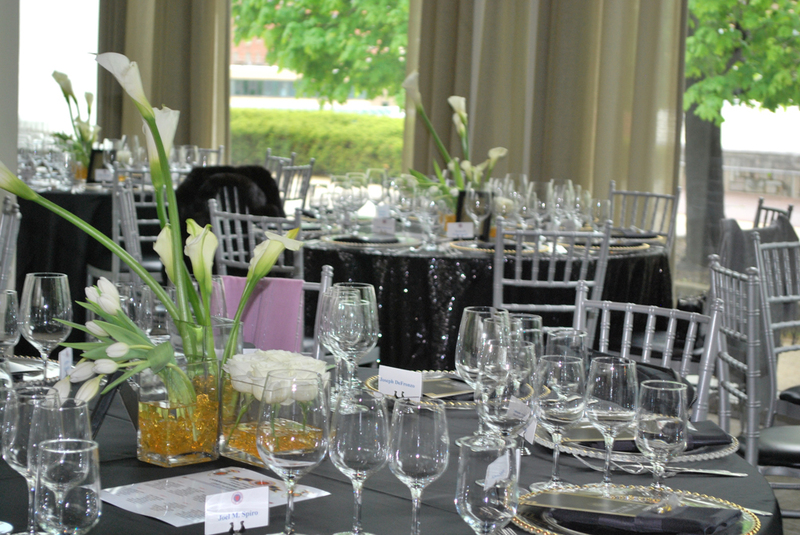 Finally, the by now famished crowd was directed to take their seats at the eight elegantly appointed tables. 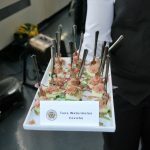 At each place setting was a pin especially designed for this special evening. 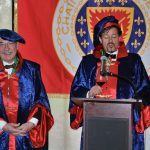 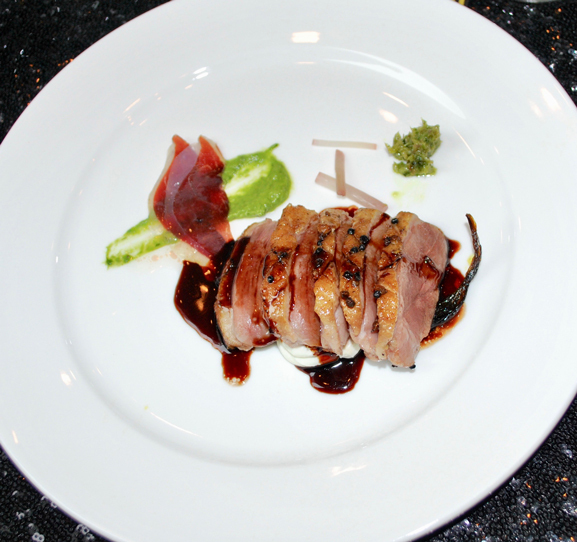 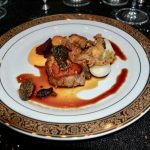 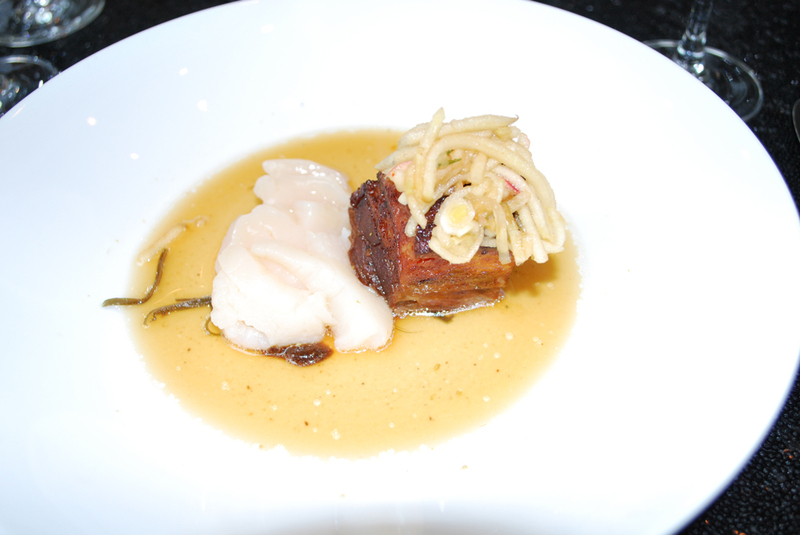 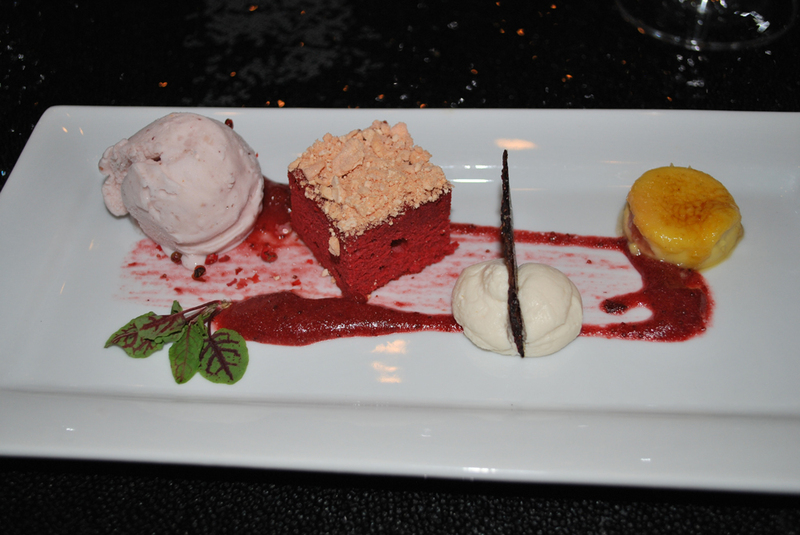 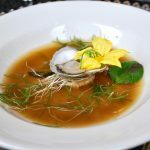 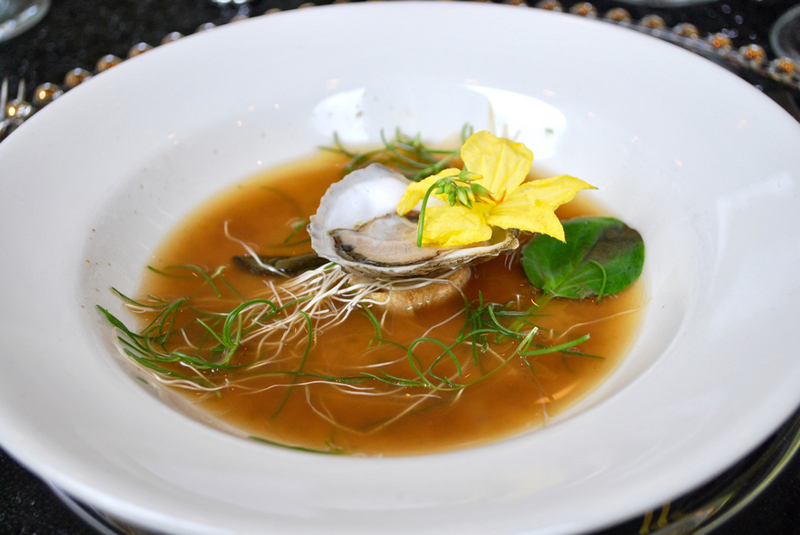 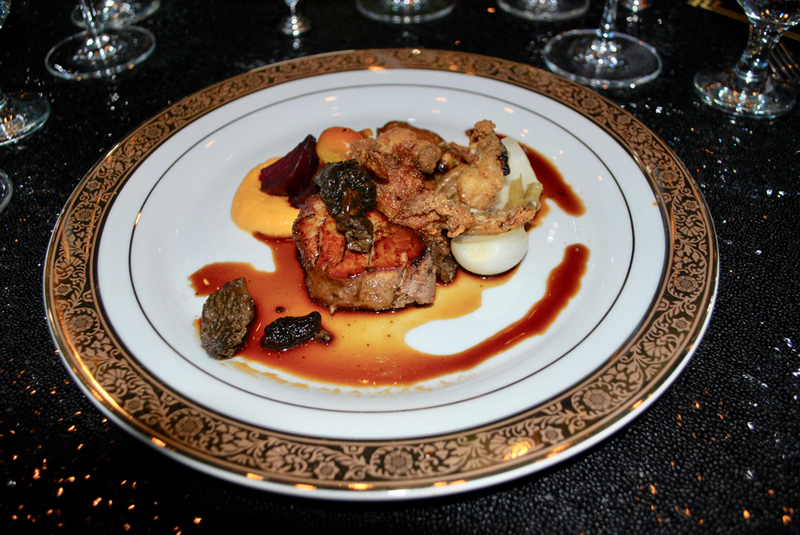 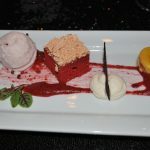 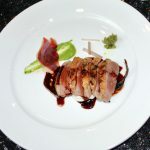 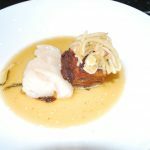 The multi-course dinner was a smashing success and the wines, including reds from the Chaine cellar, complimented the food perfectly. 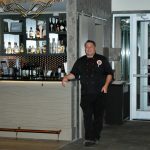 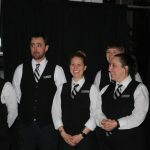 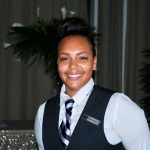 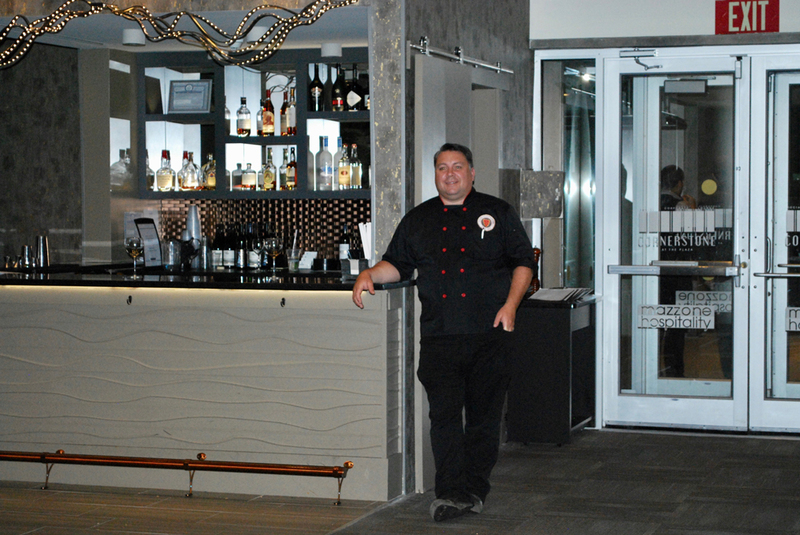 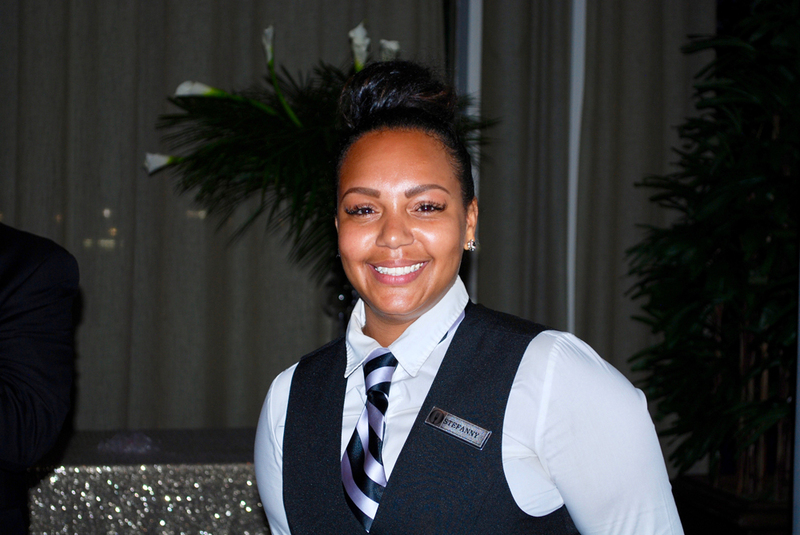 The service staff was professional and animated, moving from table to table with swiftness and dexterity, clearing dishes, replacing silver, pouring wine and serving food. 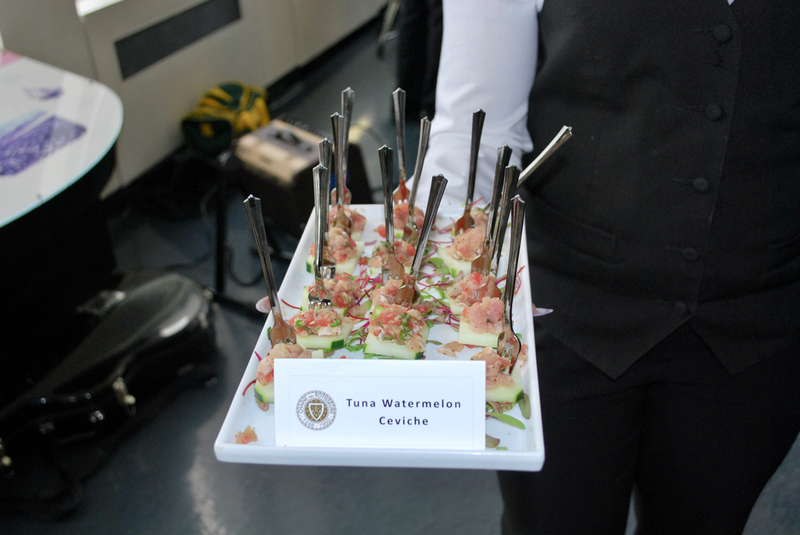 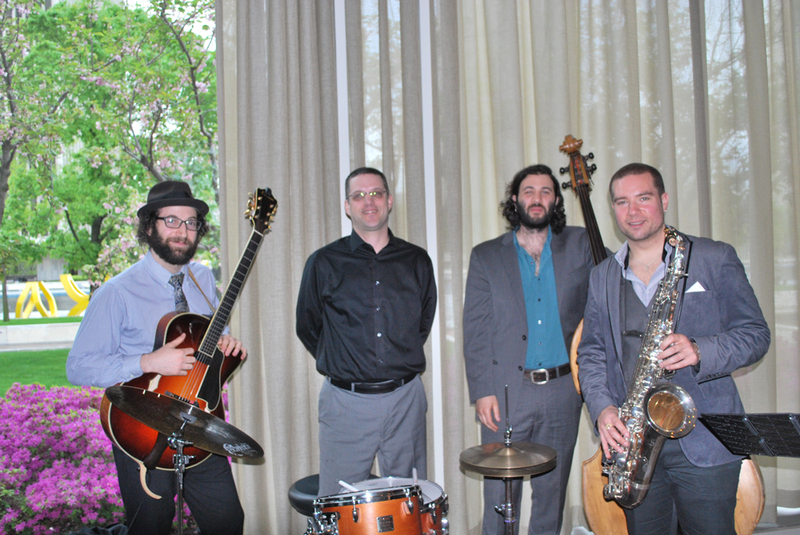 The talented jazz combo continued to entertain throughout the meal to the delight of those assembled. 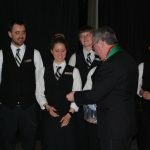 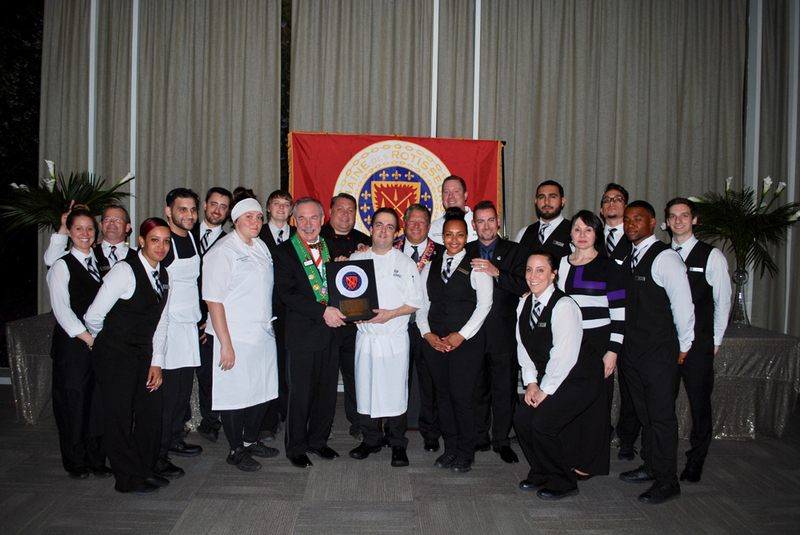 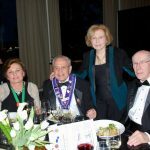 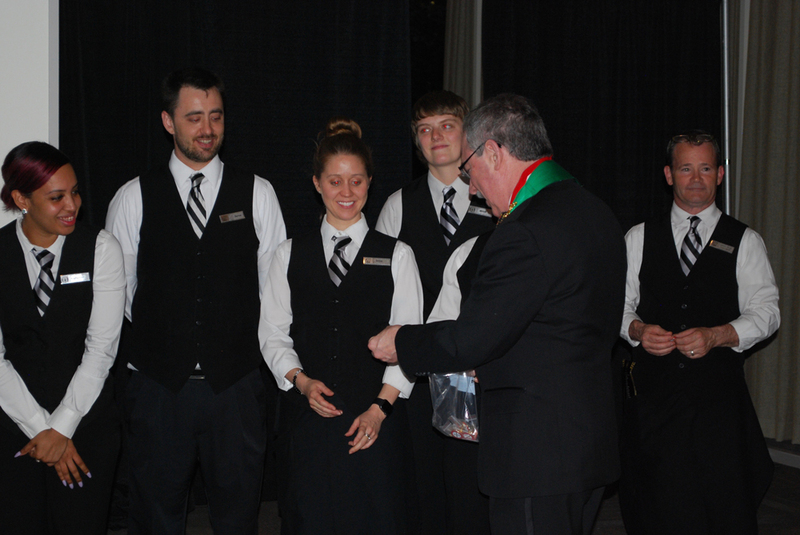 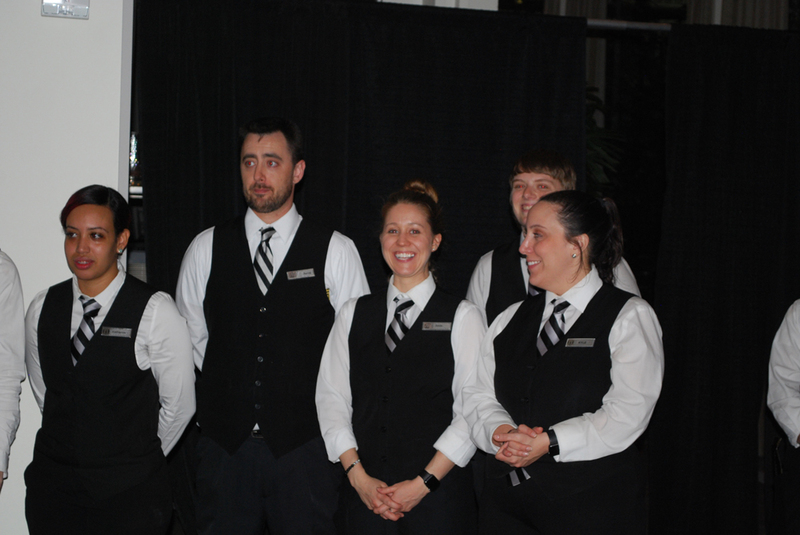 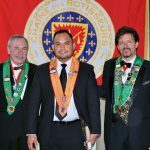 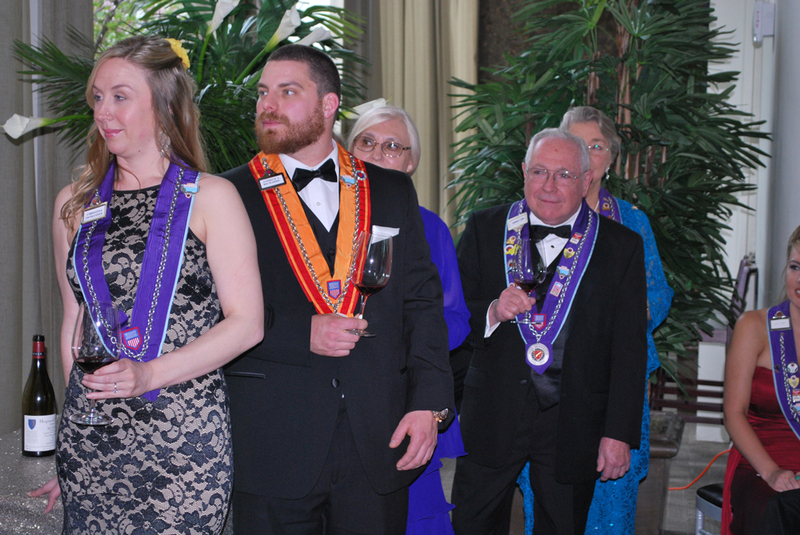 At the conclusion of the meal, the servers and culinary staff were introduced and received warm and well-deserved recognition from the Chaine members and guests. 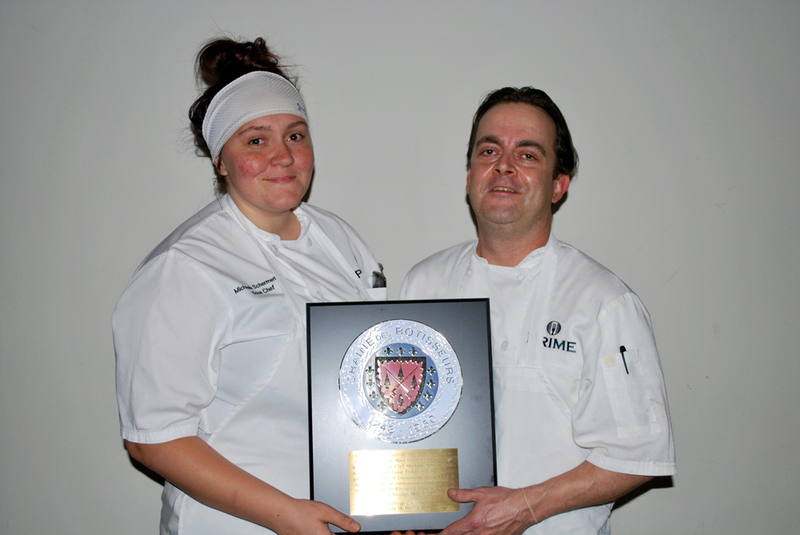 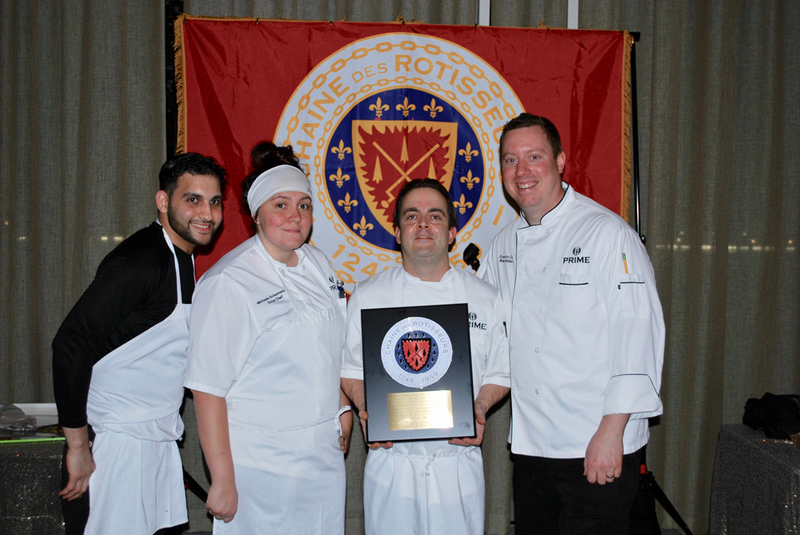 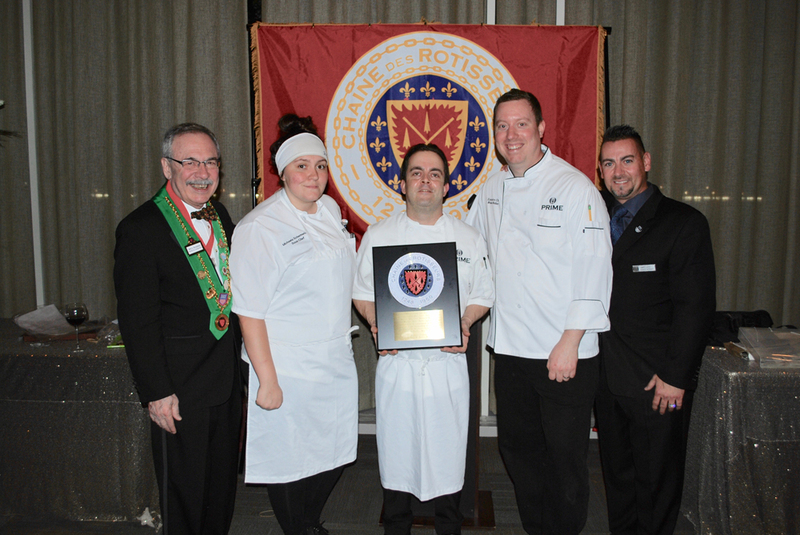 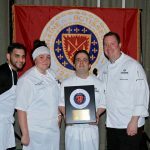 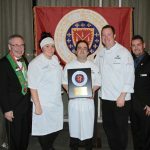 Bailli Harris presented a Chaine plaque to Executive Chef Matt Joyce, Corporate Chef Brian Molino, Chef de Cuisine Michaela Schermerhorn and General Manager Jamie Parkes, and our now sated and satisfied group departed to await our next Chaine get together.